Wilbur Wright was born on April 16, 1867, in Millville, Indiana. His brother Orville would arrive 4 years later on August 19, 1871, in Dayton, Ohio. Their father was a bishop and traveling minister for the Church of the United Brethren. On one of his trips he brought back a toy helicopter that was a foot long and made of cork, paper, bamboo, and its rotor was powered by rubber band. The copter was designed by French aeronautical pioneer Alphonse Penaud. The boys were completely fascinated by the toy, and it would spark a lifelong interest in aeronautics and flight. Wilbur was an excellent student and he excelled in school. He had planned to attend Yale University, when by accident he was hit in the mouth with a a hockey stick during a game. The injury left him without his front teeth, and it left Wilbur depressed. Instead of attending Yale he took care of his ailing mother until she died. In 1889, Wilbur and Orville started a newspaper called the West Side News. Before long, the entire nation became interested in bicycles. Three years later, the Wright brothers opened a bicycle shop where they created and sold their own designs. At the time, the Wrights were still very interested in aerodynamics, and they were especially interested in the work of German aeronautical researcher Otto Lilienthal. 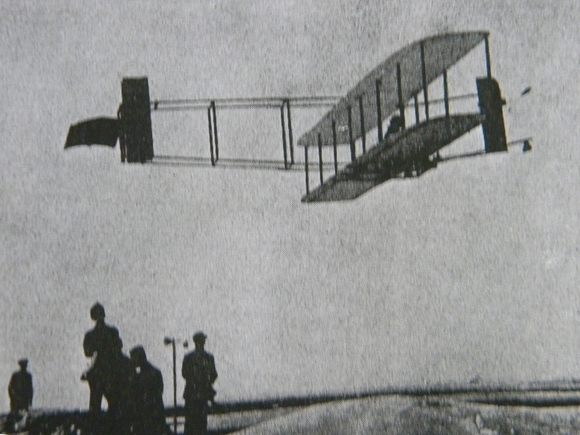 After Lilienthal died in a glider accident in 1896, the Wright brothers decided to conduct their own experiments at Kitty Hawk, North Carolina. Beginning in 1899 the Wright brothers constructed a series of gliders. Then in 1901, they constructed a wind tunnel that allowed them to conduct testing on hundreds of designs and wing surfaces. At the same time they spent large amounts of time in an attempt to emulate birds in flight which they called “wing warping.” They would not be successful until they invented a movable rudder. All of this would culminate on December 17, 1903, when the brothers became the first to fly a pilot controlled flight of a heavier than air power driven airplane. The plane only traveled 853 feet for 59 seconds. Immediately, they were bombarded by people that did not believe them. Just 2 years later, they developed the first practical airplane that could be massed produced. As a result, the brothers went to France in 1908 where they hoped to sell airplanes. As Wilbur headed to France, Orville went to Washington D.C. where he gave a series of demonstrations to the United States Army. At the time, the army purchased one plane for $30,000. At the same time, Wilbur was met by a very receptive audience in Europe. Orville soon joined Wilbur in France. Shortly after arriving the Wrights were guests of royalty and the heads of state. Before long numerous articles about the pair were published in the newspapers and they became the talk of Europe. As a result, they began selling their airplanes in Europe. The brothers returned to the United States a year later. Soon after returning they were again met with rash public skepticism as well as legal battles over their patents. At this time they founded their airplane manufacturing business which was called the Wright Company. Wilbur would die at his home in Dayton, Ohio of typhoid fever on May 20, 1912. Orville would subsequently sell his share of the business 3 years later in 1915. Wilbur spent the final 30 years of his life serving on numerous aeronautical boards and committees until his death of a heart attack in 1948.